And the ominous news continued to stream in. A friend and her husband, whose house is in smithereens, are missing. A cousin, whose house sits on a cliff by the sea, had to jump 70 meters into the rocky waters below as his house burned down; fortunately, he was rescued by fishermen. But 26 other people, who had come very close to the same coastline, succumbed to the smoke and flames before they could reach the water. As I write, the official death toll stands at 81, with an indeterminate number of people missing. Words fail me. Why did it happen? A dry winter had produced large quantities of parched forest and bush, which, on a day when temperatures reached 39ºCelsius (102º Fahrenheit) and winds gusted at 130 kilometers (80 miles) per hour, fueled the conflagration. But on this, our Black Monday, the weather conspired with the chronic failures of Greece’s state and society to turn a wildfire into a lethal inferno. Greece’s post-war economic model relied on anarchic, unplanned real-estate development anywhere and everywhere (including ravines and pine forests). That has left us, like any developing country, vulnerable to deadly forest fires in the summer and flash floods in winter (just last winter, 20 people died in houses built on the bed of an ancient creek). That collective failure is, naturally, aided and abetted by the Greek state’s perpetual lack of preparedness: its failure to clear fields and forests of accumulated kindling during the winter and spring, for example, or to establish and maintain emergency escape routes for residents. Then there are the usual crimes of oligarchy, such as the illegal enclosure of the coast around seaside villas for the purpose of privatizing the beach. Eyewitnesses I spoke to said that many died or were badly injured struggling against the barbed wire that the rich had put between them and the sea. And, last but not least, there is also humanity’s collective guilt. This catastrophe demonstrates nothing if not the manner in which rapid climate change is turbocharging the natural phenomena that punish our human foibles. As is often the case when forest fires ravage Greece, the government hinted at arson. While I cannot rule out the possibility of foul play, I am unconvinced. Greek governments have traditionally found it convenient to blame profiteers, arsonists, terrorists, and even foreign agents. With such incendiary claims dominating the news, officials avoid having to admit their lack of preparedness and their failure to adopt and enforce appropriate laws and safety regulations. What role did austerity and Greece’s ongoing Great Depression play in the ineffectiveness of the response? Fire departments, citizens’ protection agencies, ambulance services, and hospitals are terribly understaffed. While the fires would not have been stopped if we had three times the number of fire brigade workers and firefighting airplanes, a country suffering a decade-long diminution of its public services, its communities, and its morale can scarcely be expected to prepare itself well for a calamity made worse by climate change. Journalists ask me whether the European Union is helping. The reality is that we had destructive fires before and after joining the EU and swapping the drachma for the euro. 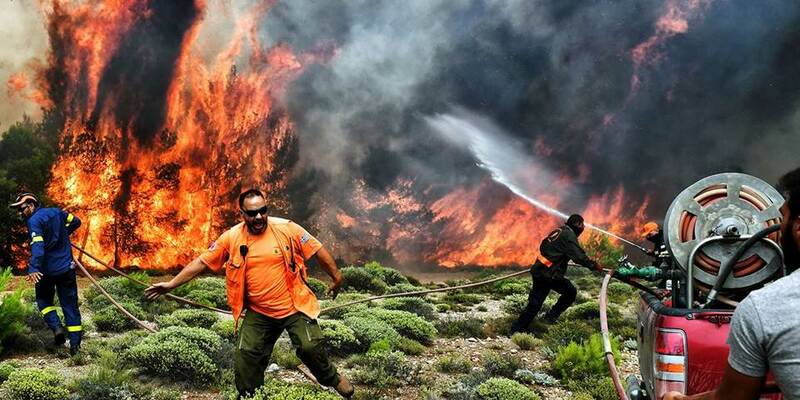 The EU played no role in helping us fight the flames, a task not in its remit, and it cannot be held responsible for the fires or for 70 years of Greek society’s abuse of the natural environment. But it is unquestionable that over the past decade the Troika of Greece’s official creditors – the European Commission, the European Central Bank, and the International Monetary Fund – has actively deprived the Greek state of the resources and capabilities it needs in such situations. Might, therefore, this not be the moment (the same journalists ask) for Athens to rebel and demand the end of austerity and of spending cuts that are detrimental to Greece’s survival? Of course! Every moment is a good moment to confront the Troika over the straitjacket of inane austerity and misanthropic social policies that have created a permanent humanitarian crisis in Greece. Over the course of a decade, we have lost many more people to the tragedy caused by the EU establishment than to any flood or forest fire. More than 20,000 people have committed suicide since 2011, while one in ten working-age Greeks have emigrated because of the economic depression the EU has imposed on Greece. I expect crocodile tears to be shed in Brussels over our fire victims, and similarly hypocritical posturing by the Greek government. But I do not expect any reversal of the organized misanthropy afflicting Greece just because nearly 100 died in a single day. Unless and until progressives across Europe get organized, accept local responsibility, and band together to apply pressure at the EU level, nothing will change, except a further strengthening of proudly misanthropic political forces like Greece’s Golden Dawn, Italy’s Lega, Germany’s Christian Social Union and Alternative für Deutschland, Sebastian Kurz’s Austrian government, and the Polish-Hungarian illiberal nexus. In this context, Greece’s forest fires are a tragic reminder of our collective responsibility as Europeans.